St. Pol de Leon (near Roscoff), and a place where you encounter few Dutch ( sshhttt little secret). With a little lady who has progressed so much in her development and prefers to always sleep in a tent. We have so many great photos that I would like to share with you. But since this message needs to be short(ish), I have taken out a special day: our wedding. It is nice to celebrate this day abroad. We always eat pies on August 4. And this time together with our dear British friends, whom we hopefully are going to see soon. 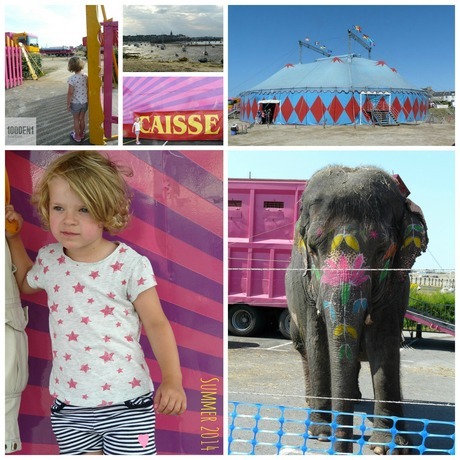 On this day we always plan a nice outing and if there is a circus in town, the choice is easy. It was very exciting for the little lady! For me too, because for me this was also the first time. I have to say that I have my reservations about animals in the circus. Doing tricks every day, traveling to a different place everyday, that's something that bothers me. And what kept circling in my mind during the performance. I definitely prefer the trapeze acts. Currently I'm working on an Hummingbird album for our most precious photos. We discovered a deserted beautiful beach, which immediately became our favorite spot. With a picnic table where we had our breakfasts regularly, did some kite flying and searched for shells and crabs. Once the album is finished I will show it to you! We'll try to keep it on the dining table as long as possible to hold on to these holiday memories.